Figure 7-42. - Supply duct systems: A. Individual round pipe; B. 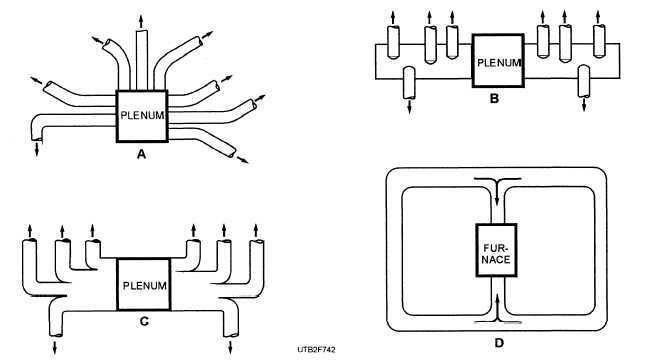 Extended plenum; C. Reducing trunk; D. Multiple return air system. Figure 7-43. 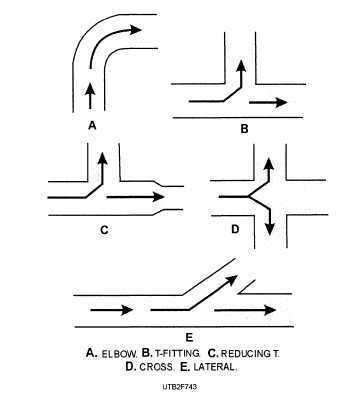 - Typical duct connections: A. Elbow; B. Tee: C. Reducing tee; D. Cross: E. Lateral. To enable a duct system to circulate air at the proper velocity and volume to the proper conditioned areas, you can use different components within the duct system, such as diffusers, grilles, and dampers. Room openings to ducts have several devices that control the airflow and keep large objects out of the duct. These devices are called diffusers, grilles, and registers. Diffusers deliver fan-shaped airflow into a room. Duct air mixes with some room air in certain types of diffusers. Grilles control the distance, height, spread of air-throw, and amount of air. Grilles cause some resistance to airflow. Grille cross-section pieces block about 30 percent of the air. Because of this reason and to reduce noise, cross sections are usually enlarged at the grille. Grilles have many different designs, such as fixed vanes which force air in one direction, or adjustable to force air in different directions. Registers are used to deliver a concentrated air stream into a room, and many have one-way or two-way adjustable air stream deflectors.